No, it’s not another song to help children learn the Aleph-Beis. 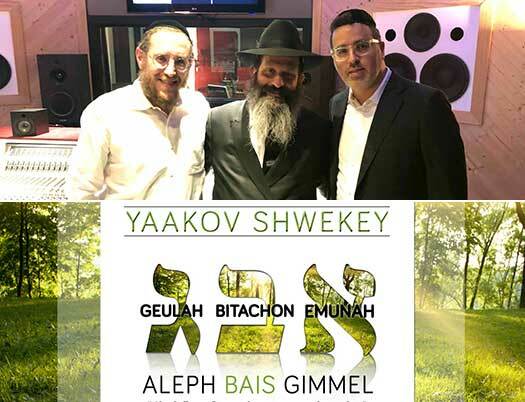 Jewish music leaders Yaakov Shwekey and Yitzy Waldner teamed up with Reb Sholom Mordechai Rubashkin to produce a song about emunah and bitachon. 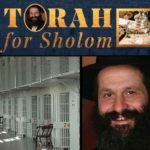 Aleph, Beis, Gimmel was Sholom Mordechai’s secret as he maintained his faith in Hashem despite being behind bars. Many heard the phrase – and the iron trust in Hashem it represents – for the first time when Sholom Mordechai referred to it upon his miraculous release. He and his family have been living with it for much longer. Five years ago, Yaakov Shwekey traveled to Otisville with Yitzy Walder and a group of Jews to bring some joy and support to our brothers held there. They braced themselves to face downtrodden, depressed people. They prayed for success in fighting the oppressive influence prison has on inmates and visitors, hoping to leave a feeling of encouragement that would outlast their time there. To their astonishment, they were met by palpable joy, as Reb Sholom Mordechai bounded into the room. He embraced them each, thanking them for coming. What followed was an inspiring experience, not only for the inmates, but for Yaakov and Yitzy – a group expression of love for Hashem and joy in our connection to Him, expressed with song and dance, punctuated by Reb Sholom Mordechai’s exuberant somersaults. Driving back to the city, Yaakov and Yitzy tried to digest their experience. What was the source of the faith and trust and joy in Hashem they had just witnessed from this extraordinary Yid? They were determined to return and repeat the experience and perhaps even learn the secret of this supernatural strength. They returned several times, leaving inspired after every visit. Inspired by Reb Sholom Mordechai, Miriam Israeli wrote the lyrics and Yitzy Waldner composed the song Maamin Benisim. Yaakov promised Reb Sholom Mordechai that when he’d be released, he would come to sing the song with him at his home in Monsey. 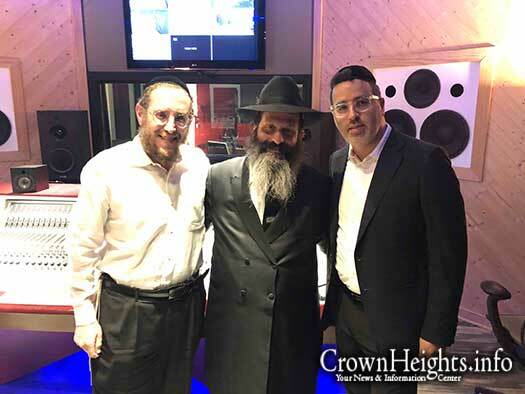 When Yaakov kept his word and went to sing that song in Monsey, Reb Sholom Mordechai suggested composing a new song to further the inspiration. The source of Reb Sholom Mordechai’s strength, his emunah and bitachon, has been and continues to be shared with larger and larger audiences. 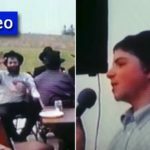 Wherever he goes, he shares details of his story and the circumstances he endured, and he sums it up for his audience: Aleph, Beis, Gimmel: emunah, bitachon, geulah. It’s a battle cry that has carried him and his family through the fight for his life. They emerged victorious, waving his statement of bitachon like a banner for all to see. Music is the language of the soul, a language Yaakov and Yitzy speak well. They have translated the message into song to express it more powerfully than mere words ever could. Arranged and mixed by Avrumi Berko, the song will be released for Lag Ba’omer, a day of happiness and belief. May the inspiration carry us through our challenges and hardships, helping us connect to our loving Father and bring us home to Him. in preparation of tis evening, listen to it then. your not the only place in the world please consider countries outside yours!!! Enjoy the song after maariv, it’s great!